What is a building inspection report? And do you need one? 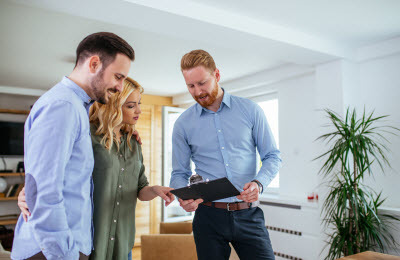 For most people purchasing a property is one of the biggest financial decisions they will make in their life and it is always important to ensure due diligence on the home has been done. A building inspection report can be part of this process and is a great way to protect your interests and peace of mind. In most circumstances, a building inspection report is included as a condition of the Contract for Sale. The investigation for this report needs to be carried out by a qualified building inspector, surveyor or builder and the cost for this report is borne by the buyer. There are a number of different types of building reports with different cost structures. For example, a basic structural inspection can be obtained for $280 for a single level three bed, two bath, brick and tile/metal home with slab on the ground, while a premium inspection which is usually used is around $495. This expenditure is a wise investment considering the potential cost of buying a property that needs extensive unexpected restoration and repairs. What does a building inspection report look like? The report will include photos and address of the property, name of the applicant, the time and date and the age of the home. It also lists the name, contact details, and qualifications of the inspector, including their WA Builders Registration number. Next, a summary of the significant findings will be highlighted to ensure the prospective buyer can easily see what necessary or immediate repairs are required. The report will contain explanations of the definitions used by the inspector to record the condition of the property and any disclaimers and information about what is not reported on. The remainder of the pages will contain photos and detailed room-by-room information on the condition of the floors, walls, ceilings, doors, and all fixtures including bathroom and kitchen appliances. What does a building inspection report cover? 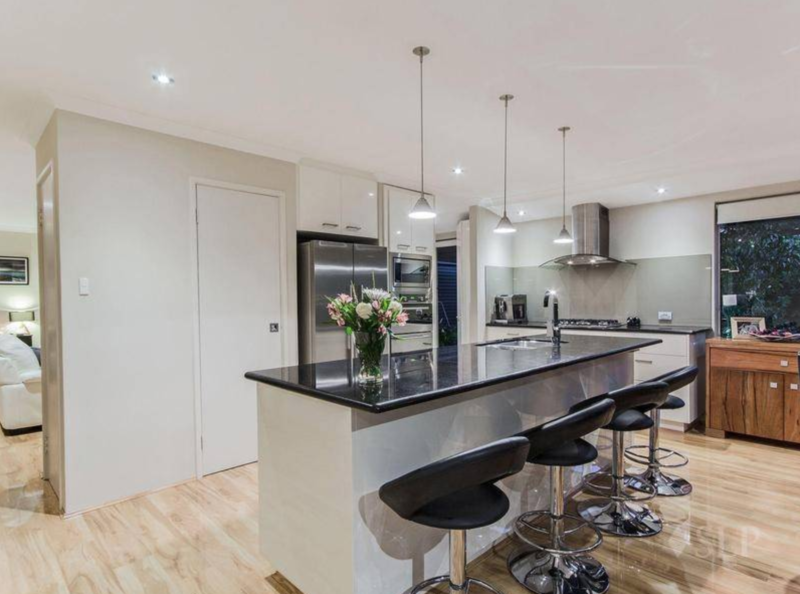 The inspection covers a visual assessment of the property and provides an opinion regarding its general condition. An estimate of the cost to repair the defects is not within the scope of the Australian Standard and does not form part of a report. If the property is part of strata or company title, the inspection does not cover common property, only the immediate interior and exterior. The electrical and plumbing systems are only checked for basic functioning. If the buyer requires a more detailed report on these systems, they will need to employ licensed professional plumbers or electricians. Reaching the 25 million population milestone should be the catalyst for the creation of productive, vibrant and liveable cities that will underpin Australia’s future prosperity. Australia’s future rests overwhelmingly with our cities and their ability to become high amenity, high liveability engines of our economy,” said Ken Morrison, Chief Executive of the Property Council of Australia. “Our population is growing strongly and most of that growth is occurring in our cities. We need to redouble our focus on policies that support investment, planning and collaboration to create the great Australian cities of the future. “Population targets, decentralisation policies or adjusting immigration rates can’t allow us to take our eyes off the main game which must be our ability to create great cities for current and future generations of Australians. “The growth of our cities is part of an international trend for cities to be a magnet for people, business, investment and economic and cultural activity. “We’re not alone in needing to plan, invest and manage for change as the worldwide trends towards urbanisation gathers pace in this ‘metropolitan century’,” Mr Morrison said. The drivers of urban growth were set out in the ‘Creating Great Australian Cities’ research published by the Property Council earlier this year. It highlighted the growing economic importance of cities around the world, and set out a series of principles and recommendations based on the experience of other fast growing cities of similar size to Australia’s. These cities are capturing an expanding share of business, immigration, visitors, talent and capital flow. The report found that Australian cities had strengths, including their economic performance investment attraction, higher education and natural environment but they were performing poorly in several key areas critical to success in the metropolitan century, including issues such as transport congestion, fragmented systems of governance, infrastructure investment and limited institutions at a metropolitan scale to manage growth. “Our cities are at the heart of Australia’s economic, social and cultural life, attracting people, investment and services that drive innovation, creativity and enterprise,” Mr Morrison said. “Any population policy that doesn’t strengthen Australia’s ability to create great cities of the future is completely missing the mark. “Our cities are already a great competitive advantage for Australia, bringing together the people, services and infrastructure to drive our economic competitiveness. “We need to keep investing in the right infrastructure, plan for a growing future and put in place smarter systems of metropolitan governance to capture the full potential of the metropolitan century while sustaining the quality of life and access to services that Australians value. “We need to take on both the challenges and opportunities of the ‘metropolitan century’ and not run away from the reality that growing cities can be successful cities and great places for people to live and work. “With the right planning, policies and ambition, we can create truly great cities for a growing Australia,” Mr Morrison said. It will also be a year of finance, with those who can secure it likely to be the ultimate winners. It’s no great surprise that Sydney and Melbourne are transitioning out of the strong price growth they’ve experienced over recent years. However, that doesn’t necessarily mean they’re going backwards. Instead, their growth may fall back to one or two per cent annually. That market transition will be driven by reduced consumer confidence, which is a reflection of the price of money as well as how easy it is to secure finance. Confidence also usually wanes when the media starts speculating about softer market conditions. It’s clear that Sydney’s market has already come off the boil and Melbourne’s is likely to follow suit but in a more moderate way. It’s important to realise that transitions happen in both directions, with some markets slowing while others are strengthening. I believe this will certainly be the case for Brisbane, which is on track to transition to stronger market conditions. That said, Brisbane is a city of different markets with the inner-city in the midst of it’s well-publicised new unit oversupply. It is Brisbane’s outer suburbs that represent good value and cash flow, as well as attractive lifestyle drivers, that will experience the most improvement in my opinion. Of course, there are already increasing numbers of interstate migrants into Queensland given it’s housing affordability as well as it’s many attractive lifestyle opportunities. I also believe it will be a year of positive transition for South Australia and Western Australia. South Australia always seems to lag behind other capital cities and by the time most investors realise what’s happening it’s too late. The truth is that South Australia’s transition is already happening. In Adelaide, however, it’s only the 15-minute ring around the CBD as well as areas like Christies Beach that are worth considering. We all know WA has been woeful over recent years, but this could be the year it finally turns a corner. The State Government has been concentrating on jobs growth, with employment numbers reportedly starting to improve. If locals start spending money because they’re more confident about their livelihoods, then, that in turn will stimulate the market. However, when I say WA, I mean Perth and select areas within the city as well. If interest rates increase, even if only by a blip, those green shoots of confidence might evaporate as fast as they appeared. Tasmania will continue to percolate until cash flow doesn’t look as attractive as other areas, such as Brisbane. I remain skeptical about Tasmania’s growth because it’s mainly being driven by investors chasing investors purely because of affordability. Owner-occupiers aren’t the ones who are pushing up prices. I believe it may lurch from under-supply to over-supply pretty quickly – and then you’ll probably have 10 years of no price growth at all. We’re now into our third calendar year of lending restrictions and I don’t believe they’re going anywhere anytime soon. Investor numbers have only recently started to slow so there will need to be more evidence before APRA loosens it’s grip on investment lending. Banks might want more flexibility but it’s unlikely to happen. So 2018 will be a year of market transition but it will also be a year of finance. The price of money remains cheap but it’s availability continues to be constrained. That’s why I believe it will be the sophisticated investors who know which markets are transitioning to the positive – and who can secure finance – who will be the property victors by the end of the year. Wouldn’t it be so nice to know what an interior designer actually notices in your home? Having this information would make it that much easier when you clean or decorate new spaces, or even when you decide what to renovate and what to leave as is. 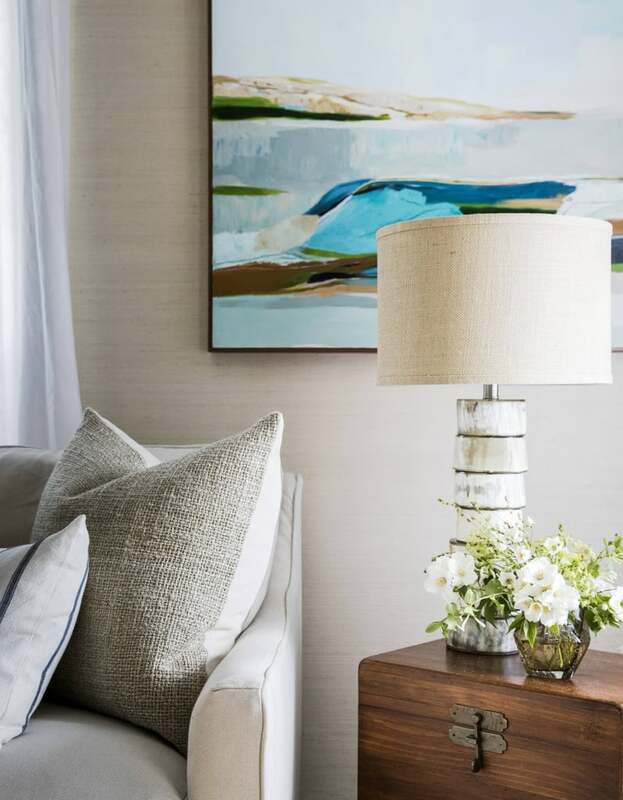 It can be somewhat difficult to take a critical eye to your own space that you see consistently day after day, but knowing where to place your focus and creative energy would certainly help to take out some of that guesswork, so we decided to reach out to design professional Shelly Gerritsma from Canter Lane Interiors instead. Read on to learn the five design elements she always notices first and wants you to focus on first as well. As soon as she steps into your home, Shelly notices what’s beneath her feet. “Flooring is a major item. If carpet is dated/worn/sagging/etc, it really devalues the home,” Shelly says. So, instead of using that area rug that has probably seen better days, opt for a brand new design in a fun print, or if you want to really get creative, try adding hardwoods in a funky colour. Shelly will notice! Once she’s assessed the flooring, Shelly is onto your wall colour and finishes. She advises that “using the proper paint finish for spaces is huge. Do not use a semi-gloss or a gloss paint finish on main living walls as it cheapens the space and looks too harsh. Stick with a flat or matte finish.” She also reminds us that nothing draws negative attention quicker than sloppy paint lines, so always ensure that those appear neat and finished. Properly scaled furnishings are key when it comes to creating a harmonious flow that’s sure to get noticed in your home. Shelly says, “Make sure that your furniture is not overwhelmingly large or so small that it looks out of balance in the space.” A huge sectional that is crammed into a space or a dainty nightstand displayed in an oversize master bedroom will do nothing but draw negative attention. And lastly, we finish up with none other than that attention-grabbing eyesore: clutter. Yes, clutter! Shelly promises, “Keeping spaces clean and clutter to a minimum is a huge plus. 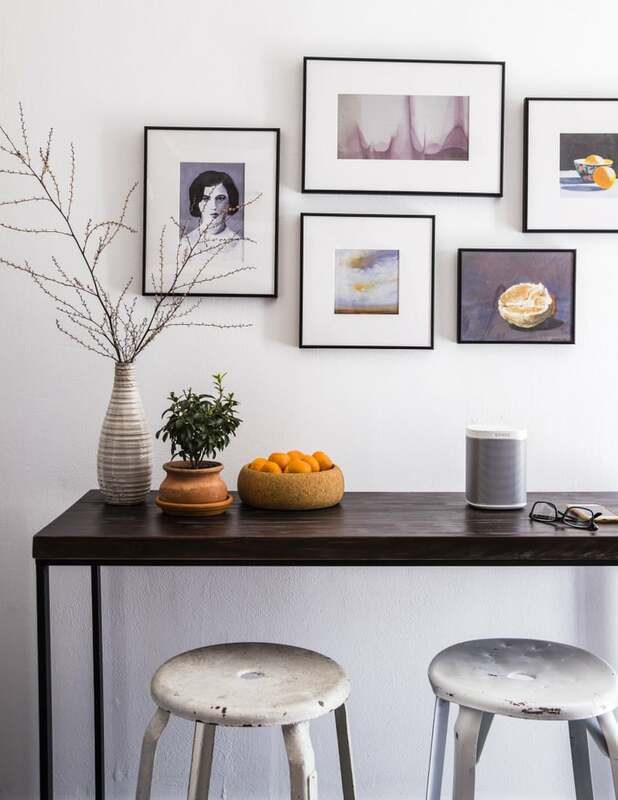 Our spaces truly affect our well being, and spaces that are messy and dirty can have major psychological and physical impact.” Plus, not only will your guests appreciate your clutter-free home but you too will benefit from your Zen space. Simon McGrath, principal of Abel McGrath in Perth told WILLIAMS MEDIA now is the time to “be strategic and make a committment to securing a property in that location you’ve always wanted”, as data from the Real Estate Institute of Western Australia reveals property prices in Perth are strengthening. REIWA President, Hayden Groves told WILLIAMS MEDIA the data indicates Perth’s median house price would settle at around $520,000 for the June 2018 quarter, which was up one per cent compared to the March 2018 quarter and two per cent compared to the June 2017 quarter. “In addition, Perth’s median unit price is expected to lift by 4.9 per cent to $419,500 for the June 2018 quarter, which is 2.3 per cent higher than the same time last year,” Mr Groves said. “After declining during the March quarter, it is pleasing to see prices rebound strongly this quarter. With the worst of the market downturn appearing over, the improvement in house and unit prices this quarter suggests buyer confidence is returning which should bode well for sellers as we move into spring,” Mr Groves said. Mr McGrath’s advice to those looking to enter the market is to act now. “At times like these, properties become available that would generally not be available. That is the big gift in this market,” McGrath said. Overall, Mr McGrath says the market is “okay, but not great”. “Perth is nothing but a big mining town. 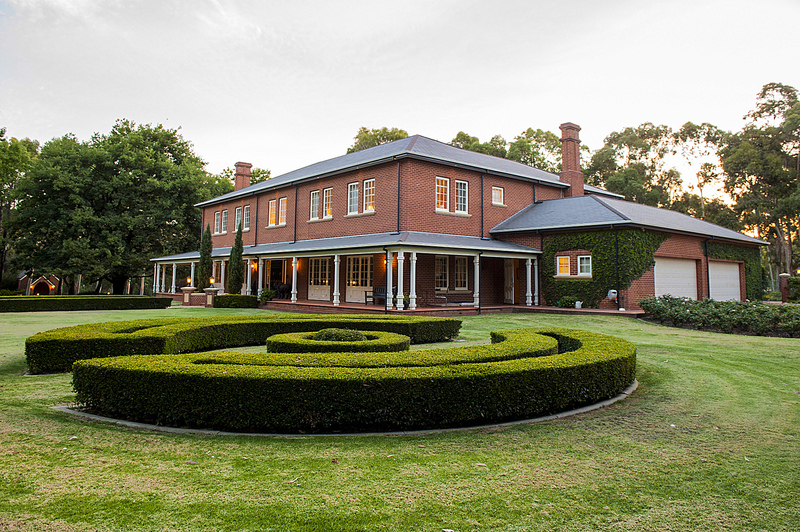 The flow-on effect from the mining industry affects Perth’s real estate market, so you’ve got a real upswing. Behind the scenes there is plenty of optimism. “There is still plenty of caution in the market, prices aren’t shooting up. It is a very stoic market. “We are seeing reasonable numbers at home opens, but it can be very spasmodic. Some home openings will be fantastic, others very quiet – there is no rhyme or reason to it,” Mr McGrath continued. With 6,900 sales recorded during the June 2018 quarter, sales volumes declined during the June quarter. Mr Groves said the onset of winter likely contributed to subdued activity levels. Despite the overall decline in sales, numerous suburbs recorded more sales this quarter than they did in the last quarter. REIWA data shows the composition of sales shifted during the June quarter, with more house sales recorded in the $800,000 and above price range than in the last quarter. “The June 2018 quarter continued the trends observed during the December 2017 quarter, with good quality family homes attracting a lot of attention in aspirational areas,” Groves told WILLIAMS MEDIA. “As the Western Australian economy begins to regain strength and owner-occupier loans remain the most affordable they have been in decades, buyers are recognising there is good opportunity to secure a family home in areas that might previously have been considered out of reach,” Mr Groves said. Mr Groves told WILLIAMS MEDIA stock levels across the metro area have declined 1.1 per cent during the June 2018 quarter. On average, it took 67 days to sell a house in Perth during the quarter, one day faster than both the March 2018 and June 2017 quarters. Mr McGrath told WILLIAMS MEDIA that although the market is pretty tough, his area in the western suburbs of Perth have short supply. “There’s no denying – it is pretty tough. The good news in the western suburbs is that we have got short supply, whereas in the greater Perth market there is oversupply in many places. The short supply in the western suburbs is ticking the value of buoyance.” Mr McGrath said. Data for the June 2018 quarter shows the proportion of vendors who had to discount their asking price in order to achieve a sale declined by five per cent. Figures from the Housing Industry of Australia (HIA) Affordability Index show Perth is the most affordable of the nation’s capital cities. In the June 2018 quarter, the Housing Industry of Australia (HIA) Affordability Index registered 74.9, up by 0.4 per cent over the quarter and up by 0.8 per cent compared with a year earlier when affordability had reached its poorest level in nearly six years. The HIA Affordability Index is designed so that a result of exactly 100 means that precisely 30 per cent of earnings are absorbed by mortgage repayments. Higher results signify more favourable affordability – those above 100 signify that mortgage repayments account for less than 30 per cent of gross earnings, whereas scores below the 100 mark mean that more than 30 per cent of average earnings are absorbed by mortgage repayments. 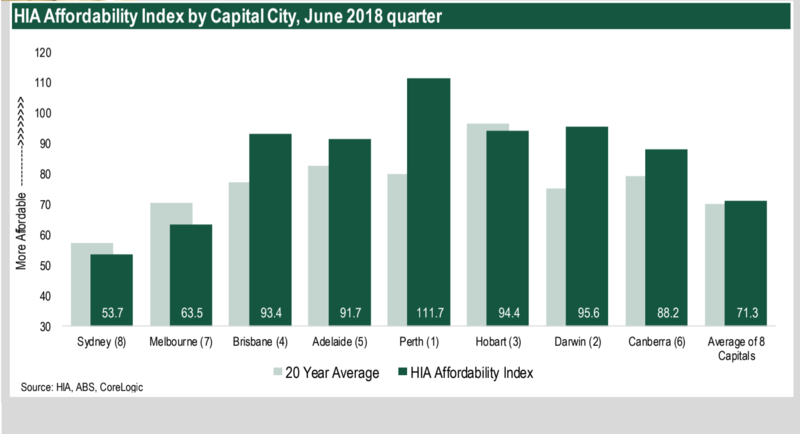 According to HIA’s analysis, Perth is the most affordable capital city to buy a home in with an affordability rating of 111.7, closely followed by Darwin (95.6), Brisbane (93.4), and Hobart (94.4). 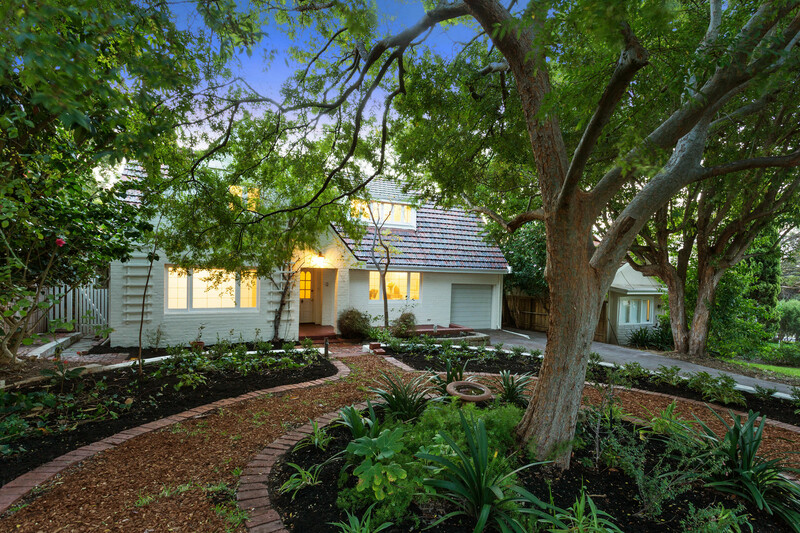 37 Marita Road, Nedlands, Perth under offer with Michelle Kerr from Abel McGrath as featured on Luxury List. 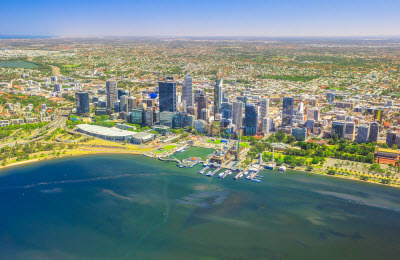 “Perth continues to present good opportunities for buyers, especially in the more affordable end of the market,” President of the Real Estate Institute of Western Australia (REIWA) Hayden Groves told WILLIAMS MEDIA. In news that will surprise approximately no one, Sydney remains the least affordable capital city to purchase in, with a miserable affordability rating of 53.7. HIA Economist Diwa Hopkins says affordability is hugely improving considering this time last year, affordability was at the lowest level in over six years. “Easing house price pressures are providing some affordability relief for home buyers. “Previous strong price increases were met by an unprecedented level of building which is now starting to come online. This is providing much-needed additional supply in key markets, helping to reduce price pressures and ultimately improve affordability for home buyers,” Hopkins said. But the current plunge in house prices is unlikely to last for long, Hopkins warns. “With an even balance in overall housing supply and demand in these key markets, the current downturn in dwelling prices is unlikely to be prolonged or severe. “We could expect this downturn in prices to play out like previous cycles. They typically last 12 to 18 months, with the size of the fall modest relative to the immediately preceding expansion,” Hopkins said. Both rent and dwelling prices have been falling in Perth and Darwn for the last five years, amid the ongoing fallout from the resources boom and bust cycles. While this is great news for renters and buyers in a market previously notorious for poor housing affordability, Hopkins warns it may be symptomatic of wider economic problems and in particular slowing population growth. The weak economic conditions in both of these cities are seeing more people leave for interstate than are arriving, Hopkins says. In particular population growth has followed these cycles and currently both cities are seeing more people leave for interstate than are arriving, resulting in spare capacity in their respective housing markets. New home building activity has also fallen sharply in both cities as a result of the price declines, which risks causing an undersupply to emerge over the longer term in Perth and Darwin. Groves told WILLIAMS MEDIA buyers are cautious right now. “Trade-up family home buyers are lamenting they didn’t buy six months ago when the bottom of the market was apparent. Sellers who’ve been considering selling over the past few years are now cautious about coming to market too soon in anticipation of selling for more in the short-term future, especially down-sizers looking to maximise their capital-gains-tax-free benefit. “Investors are likely to remain cautious until they see tangible growth which is likely to be towards the end of this year,” Groves said. According to data from REIWA, the rental yield for the Perth Metro region for houses currently sits at 3.6 per cent based on the overall median house rent price of $359 per week and median house price of $512,500. This means on average, a typical property investor can expect to generate a 3.6 per cent annual return on their house purchase price. REIWA says the suburbs of Bullsbrook, Medina, Parmelia, Armadale, Cooloongup, Maddington, Stratton, Camillo, Warnbro and Merriwa are house rental hotspots, offering investors the best return on their investment. 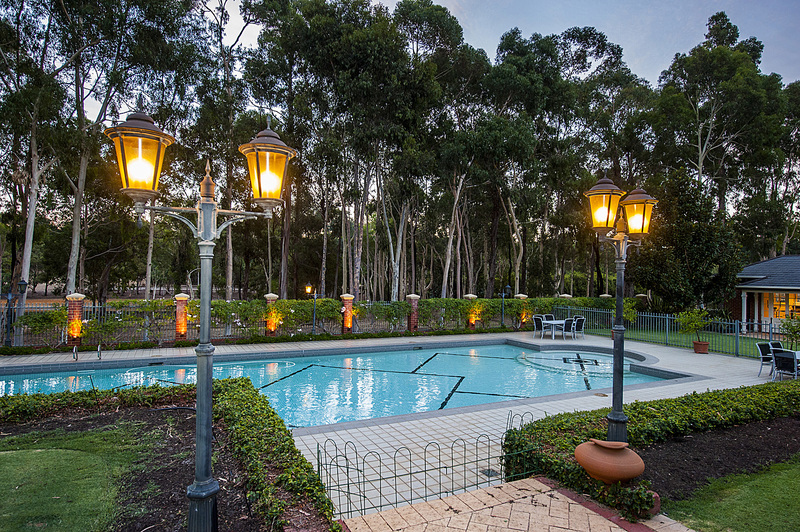 “With our local market on the cusp of recovering, now is the time for buyers and investors to take advantage of favourable conditions before our local market becomes less affordable,” Groves told WILLIAMS MEDIA. Chief Operations Officer for Professionals Real Estate Group in Western Australia, Shane Kempton agrees. 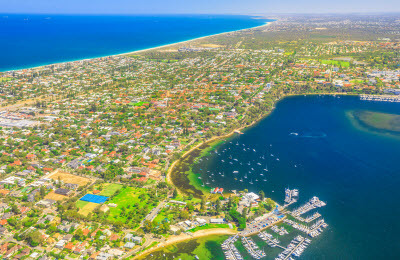 “In the vast majority of areas in Perth, property prices are very low and buyers should now move quickly to secure a property before the recovery in the market gains further momentum to avoid buyers regret,” Kempton told WILLIAMS MEDIA. View the Housing Industry of Australia (HIA) Affordability Index here. 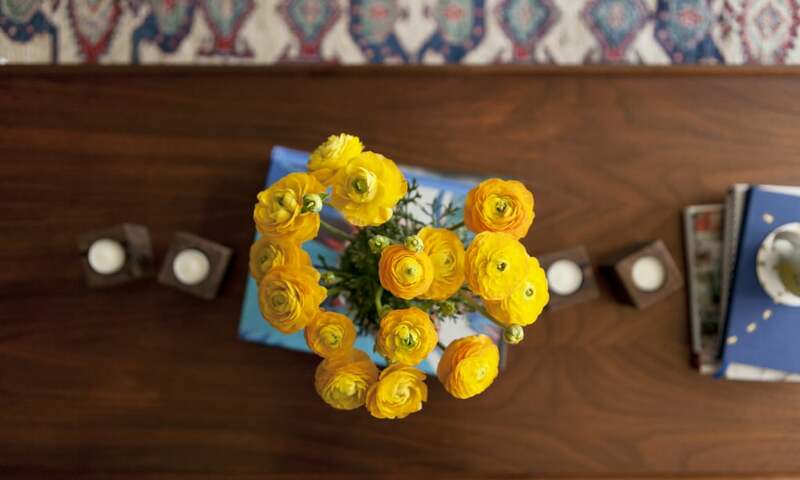 Are you looking to jazz up your home but don’t have the available funds? Maybe you are planning to sell, or just want to give it a facelift? Either way you don’t need to spend an arm or a leg, you just need a little bit of inspiration. 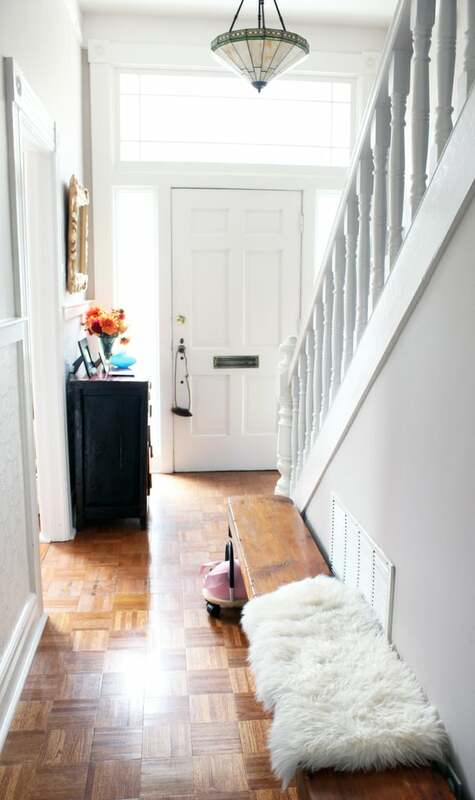 Here are five ways you can give your home the ultimate make-over without breaking the bank. Start by a good old clean out – this you can do for free. Living in a messy, cluttered house will have you feeling anxious and itching for a change of atmosphere, plus it won’t make a good first impression on visitors. rid of junk you don’t need, wash the walls, doorways and clean all the dust and cob-webs! This will have an immediate effect on the oxygen circulation of the house – breathing in fresh air is the start to feeling good in your home. 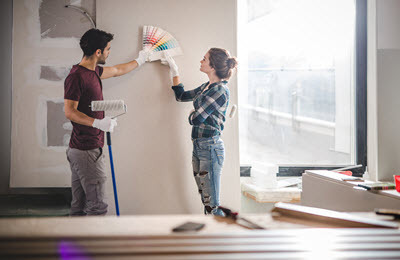 Whether you want to change the colour all together or just want to lift the look,the most effective way to rejuvenate your home is to apply a fresh coat of paint. Light to neutral colours gives you more flexibility with furniture and décor, and creates the illusion of space. Plus, painting your home is relatively cheap, unless you want to seek a professional painter to do the job. While you have the paint out, it is also a good idea to re-paint the doors, door frames, skirtings and ceilings in simple white, to freshen up the aesthetic of your house. For some inspo, find out how to select the right paint colour for your home. It is ridiculously affordable to decorate your home these days, you just need to trigger your creative side. Adding plants and some pottery to your home is a great way to set the mood and can be very affordable and easily maintained with a little bit of TLC. Adding a splash of greenery to your space is not only aesthetically appealing, but pot plants also help purify the air, just make sure you buy plants suitable for indoors. Candles, incense and infusers also have dual purpose when it comes to décor. They look good, and smell good, once again adding that infused delicious aroma to your home. When it comes to the bedroom and living rooms, pillows, throws and new linen is something that will always catch the eye. What better feeling is there than purchasing fresh new bedding? Try and coordinate this with whatever colour you paint the walls or keep the same colours but you can mix up the styles. Remember, simple can sometimes mean more, so try keep all decorations minimal but effective. If you already love your furniture but still feel sick of it, a simple re-organise of the couches, TVs beds, tables etc can make you feel like you’re in a whole new house. Making different uses out of the things you already have in your home will save you money. You think you might be sick of an item, but put it somewhere else and you might fall in love with it all over again. Lighting is the key to making any home stand out, and you would be surprised what a simple swap of the light fittings will do. If you’re on a budget consider going for one or two designer light fittings in the main living areas, then cheaper ones for the other rooms. While we are on the topic of lighting, you can also replace the light switch covers which won’t cost you a lot at all. Swap out those old fashioned, plain switch covers for silver, stainless steel or modern white covers. Many investors steer clear of vacant land because they mistakenly believe they can’t claim interest repayments on it. In fact, the biggest thing that most accountants get wrong when advising clients on vacant land is that the interest component on it isn’t tax deductible. I’ve had many arguments with many accountants about this topic over the years! The key component is the clear intent to build a property within a reasonable timeframe. If the investor was audited, the investor would need to prove that the timeframe – whether it’s a few weeks or months – was necessary to enable to construct the investment property. I’ve heard this ‘non-advice’ so many times over the years and that’s why it’s so important that you get advice from a property accountant with a strong understanding of the relevant legislation. With vacant land, there are a number of different strategies that you could implement. The first one is residential land that is being carved up by a developer, but you buy before the titles for each individual block have been registered. Effectively, you’re buying land off the plan, but it’s important to understand that there are pros and cons to this strategy. The pro is that if it’s in a high-demand area and you’ve bought during the early stages of development, you tend to make some money. You also generally only need to put down a few hundred or thousand dollars as the deposit. Naturally, because you are very much dependent on how fast the developer can register each block, you’re at the whim of the market, which can be a con. For example, in my portfolio, I once bought 18 blocks of land that were not yet registered. In fact, registration wasn’t supposed to happen for another two years. However, it happened in just eight months and I wasn’t ready. So all of a sudden I had 18 parcels of land that I had to settle on, but I didn’t have my finance organised. After discussing it with the developer, I ended up settling on four of them and he released the other 14 back to the market, which worked out well for him because the market had improved. So, if the land is registered well ahead of time, you can be left scrambling. the entire subdivision or development. Plus, everyone will be building at the same time, which means you’re competing for trades and will likely be finished at the same time, too, and that means a strong likelihood of softer prices. What about greenfield and infill sites? When I say greenfield sites, I mean blocks of rural land that you intend to rezone for residential usage. Now this is a strategy for more advanced investors because there is more risk as well as a higher financial component required for earthworks and approval costs. Greenfield sites can be bought for an affordable price, but if you can’t get the subdivision approved you need to have the money behind you to fight all your way up to the Environment Court if necessary. A better strategy is to target infill sites within already established residential areas. In this scenario, you buy a larger block of land, usually with a house on it, to carve off the land at the back or the side to sell as vacant or with a new property on it. The other option is to subdivide, then construct a new dwelling and then keep both. Infill developments can also lean towards knocking the old house down, splitting the block into two and selling the vacant land, or building two houses or even multiples. It must always come back to whether there is a market for your project and whether the numbers add up, because you must take into account all of the costs on the way in and on the way out. That way you can make an educated decision whether to keep holding long term or take your profits to invest elsewhere. Whichever strategy you choose, you must do your figures on the worst-case scenario to see if it adds up. That’s because land generally has a lower, or no yield to start off with, which means your holding costs can be higher than with a house, for example. At the end of the day, vacant land as a strategy, does work. You just need to have your eyes wide open to ensure your figures are correct and you must understand that it might be a while before income rolls in. Finally, it goes without saying that you must get tax advice from a specialist accountant who understands property. If you don’t, you could end up with pockets just as vacant as the land you’re investing in. If searching for your keys is a part of your morning ritual, it’s time to break the cycle. Being organised is more than just a personality trait, it’s a lifestyle decision that’s easier to achieve if you stock your home with the right tools. 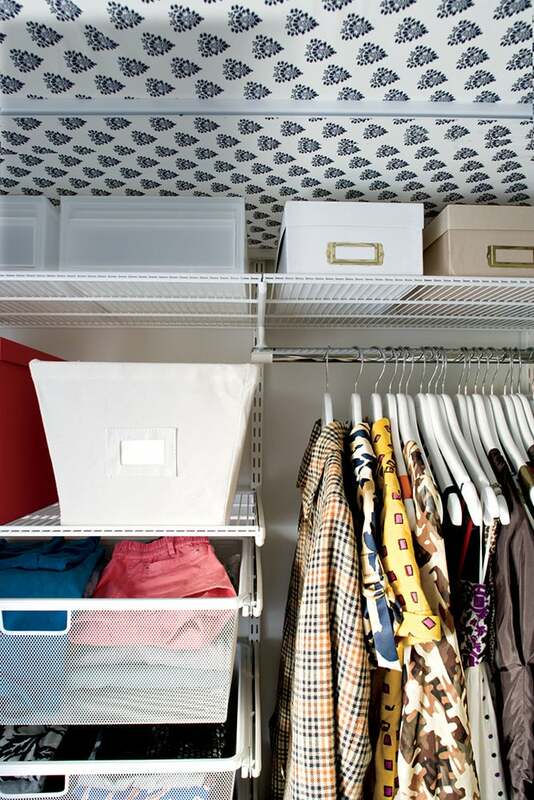 These 15 clutter-busting essentials will make your days feel longer and less stressful. Cheers to that! 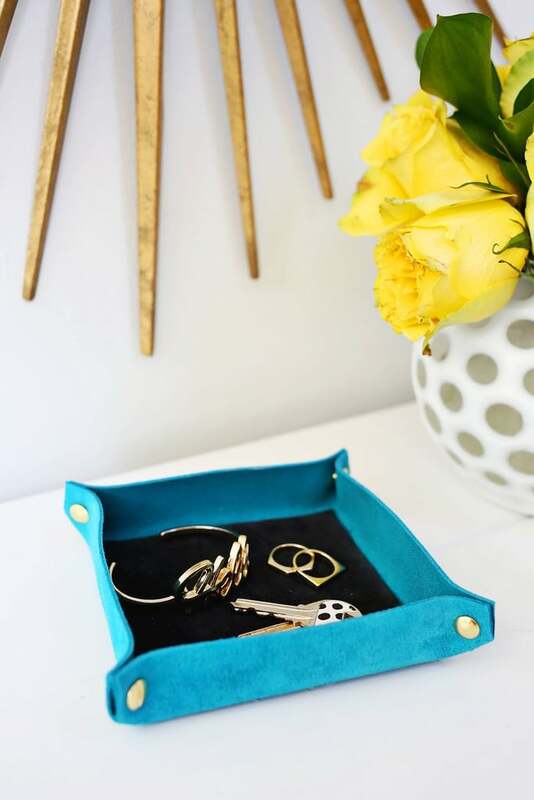 Idea: If you don’t want to hang a key hook, do yourself a favour and get a key catchall. Having a designated place to place your keys when you walk through the door will save you from the “running late” syndrome. Don’t be that person. Idea: You know how it goes . . . You take the time to meticulously fold sheets and towels, and by the end of week, it looks like a bomb exploded in your linen closet. Here’s where clear shelf dividers come in. 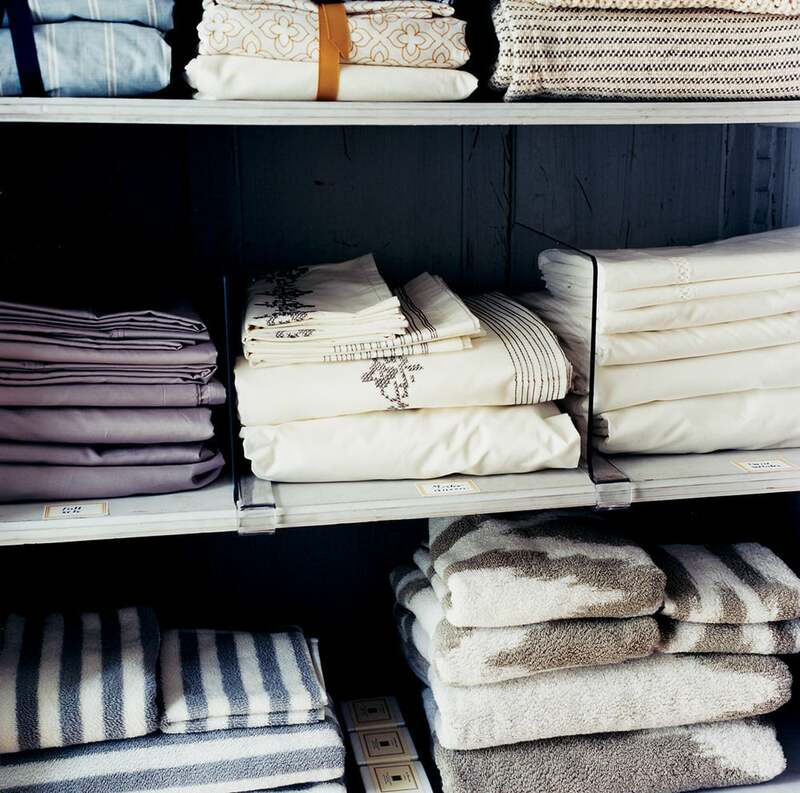 They’ll keep your stacks of linens in order without creating an eyesore. Get it: Stock up on these acrylic shelf dividers to tame your most unruly closet. 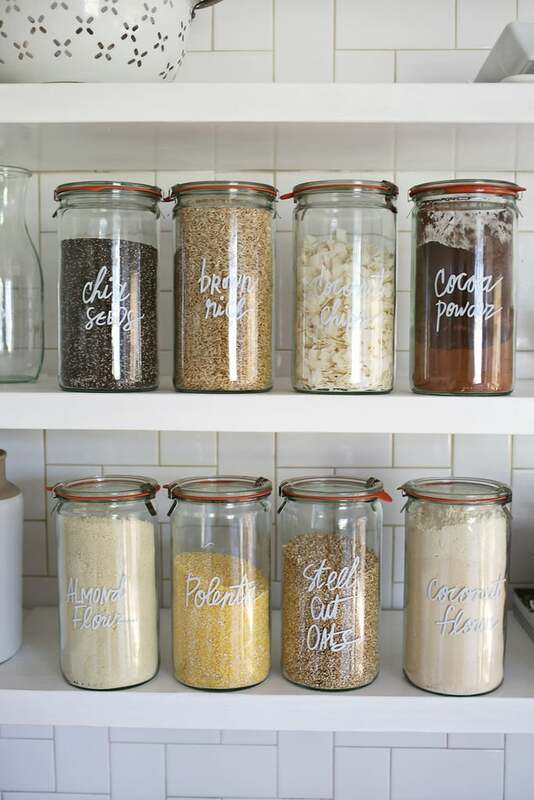 Idea: Put your pantry on display by keeping dried goods and other treats in lidded glass jars. Get it: You can get her kitchen jars at Ikea. Idea: If you’ve seen these used to hang pots and pans, you’ll be happy to know that the idea translates for any room in the house. 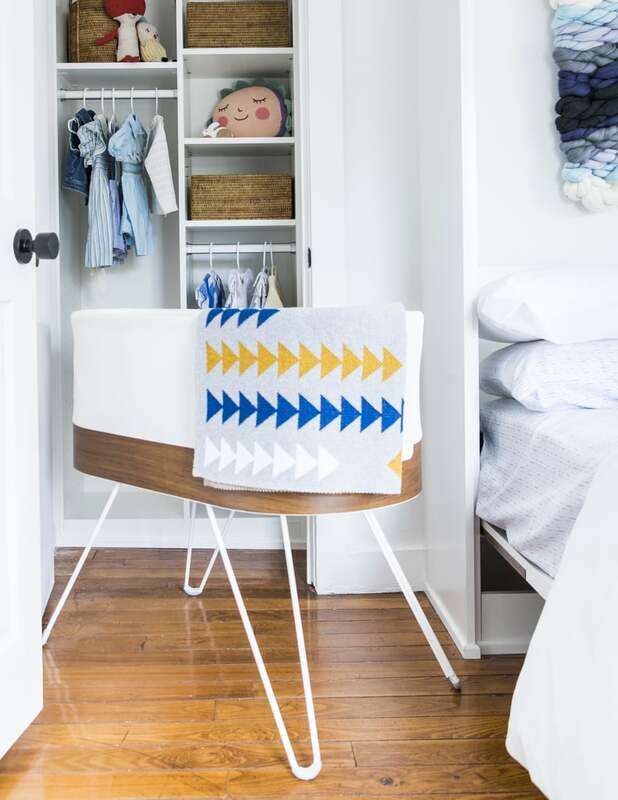 We love how Sugar + Cloth blogger Ashley Rose used one for above-the-bed storage and decor. 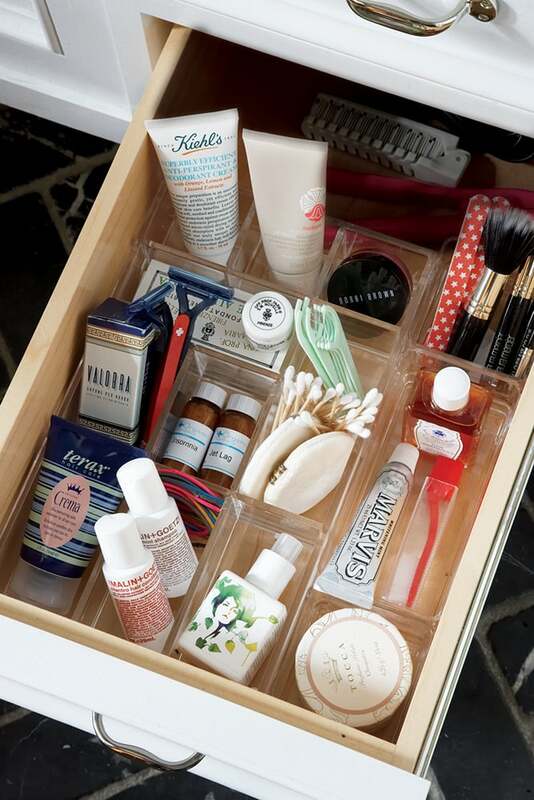 Idea: If shuffling through a drawer to find a tube of lipstick gives you anxiety, you’ll be amazed by the efficiency that a simple drawer organiser can offer. 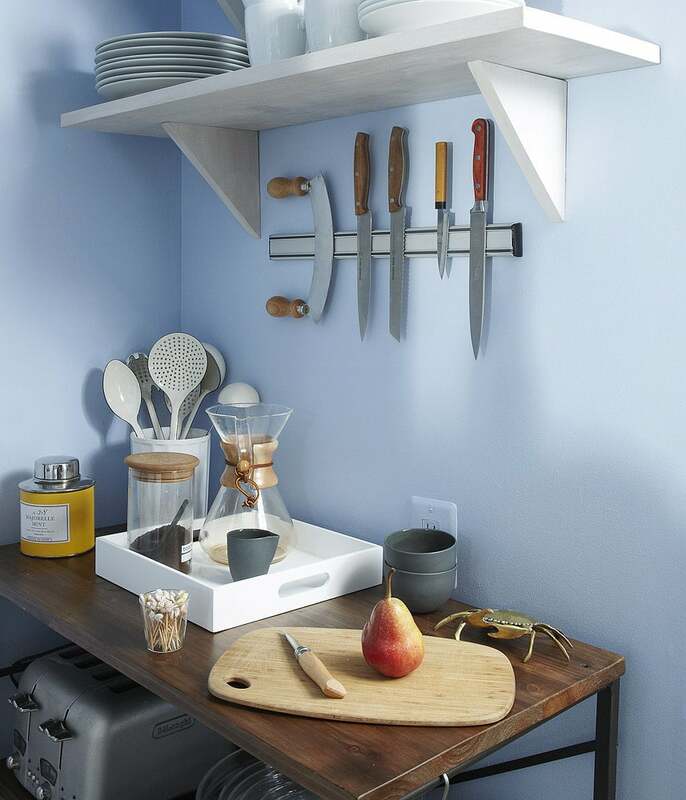 Idea: Forget the space-saving allure of forgoing a knife block — we’re crazy about the fact that you can see the shapes and sizes of your most utilised knives while keeping them in reach. Idea: It’s amazing how quickly a tray can corral clutter. 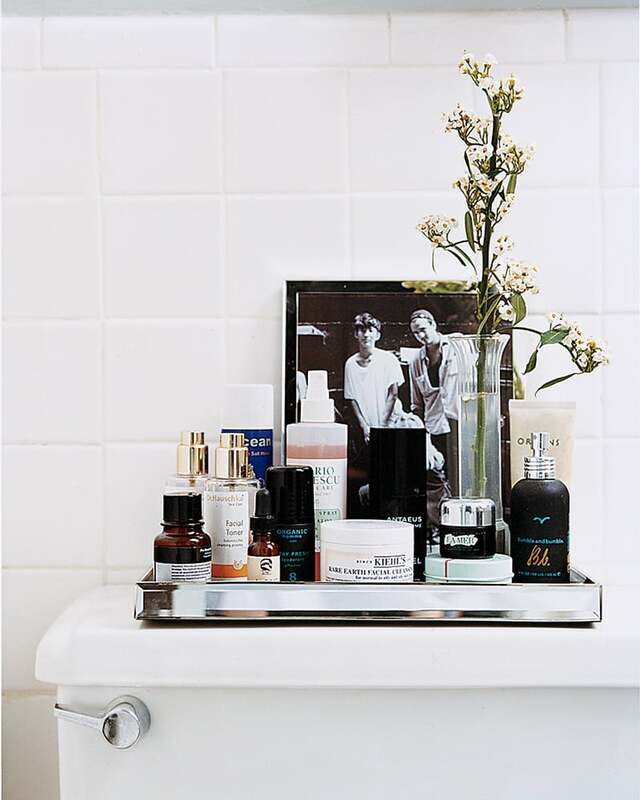 Bonus points for turning the top of your toilet into an extension of your medicine cabinet (with the addition of a slim bud vase and framed picture, of course). Idea: Labelled boxes are a great way to organise the things you want out of sight. Idea: Sure, you can use them to hang a curtain, but they work wonders in making the most out of shelves. 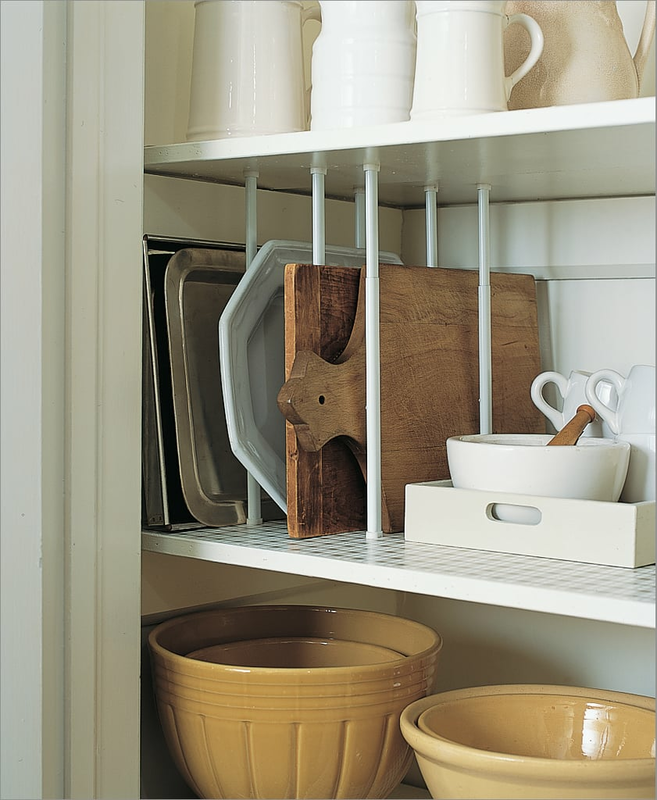 Follow Martha Stewart’s lead, and use them to organise kitchen items like pot and pan lids, trays, and cutting boards. Idea: Whether you need more storage space for clothes or craft supplies, these wall-mounted mesh drawers allow you to customize your storage and easily see what you’re storing. 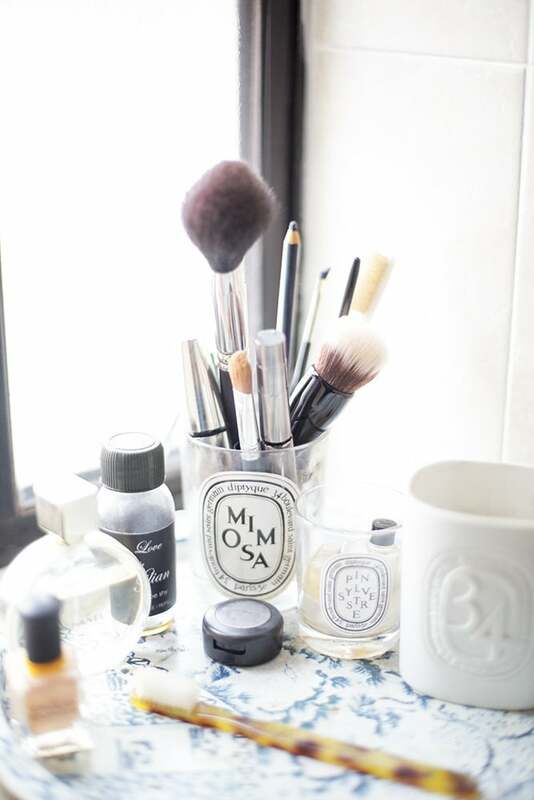 Idea: Instead of cramming makeup brushes into a messy drawer or makeup bag, keep them within easy reach in a stylish cup. 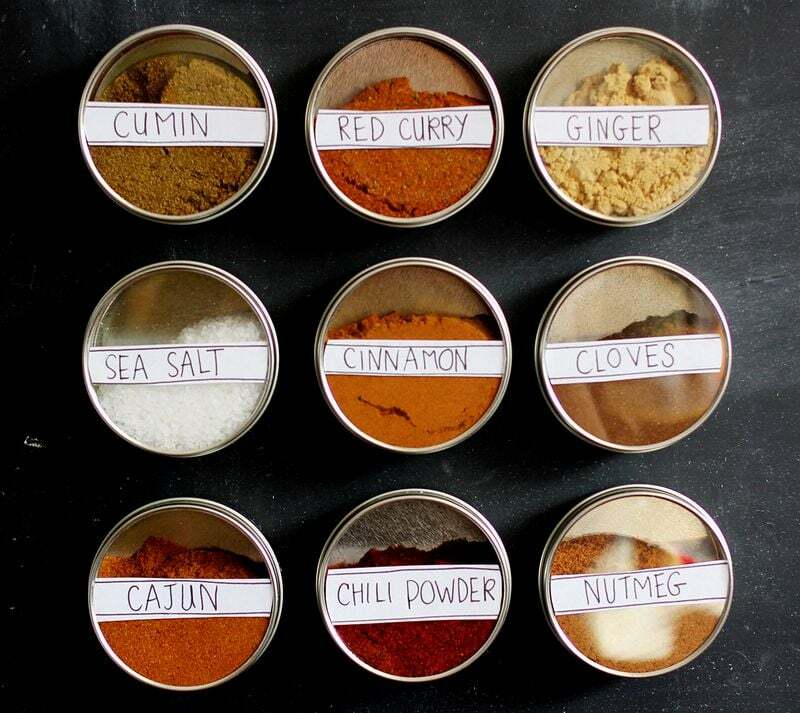 Idea: Whether it’s a drawer filled with neat rows of spices or a creative DIY that frees cabinet space, every organized cook seems to have their spice collection under control. Get it: A Beautiful Mess has an easy-to-follow tutorial for making these nifty magnetic spice jars. Idea: Running out of it when you need it is the worst, but stacking it in plain sight can cramp your bathroom’s style. 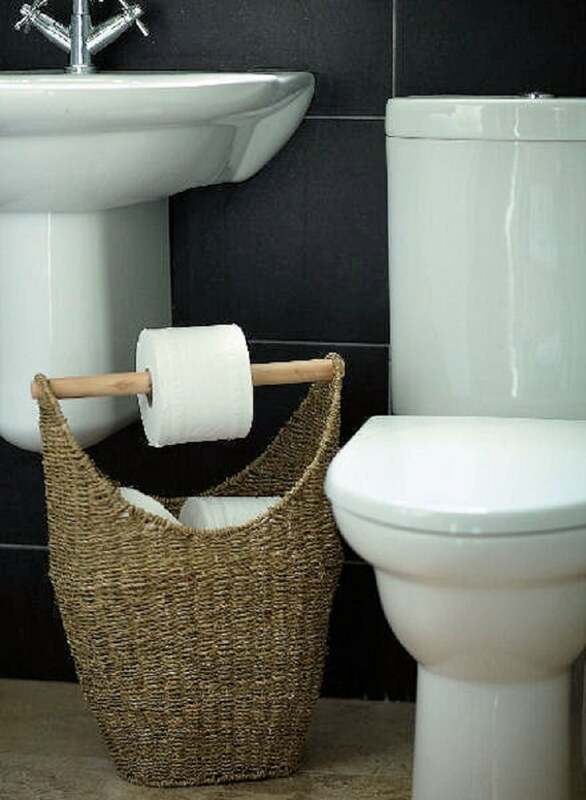 Kill two birds with one stone by turning a basket into a toilet paper organiser and dispenser. Idea: A lack of cabinet space doesn’t have to stop you from owning bulky appliances like KitchenAid mixers and high-powered blenders. 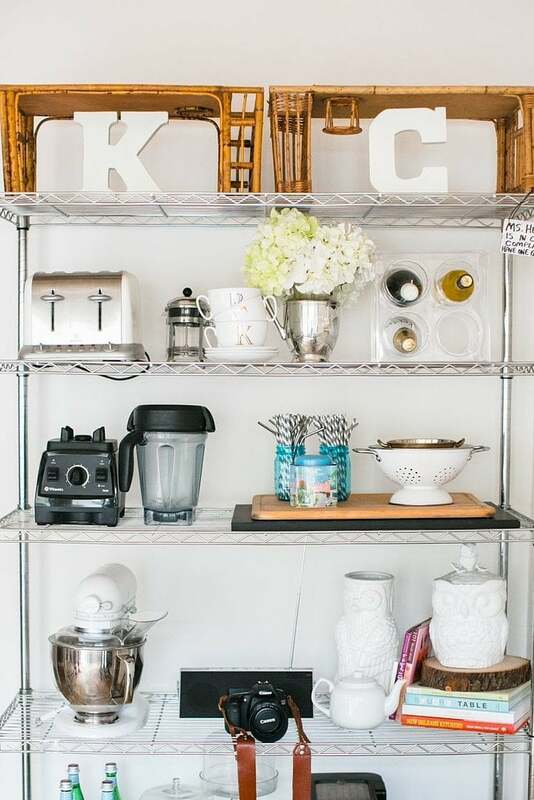 Some of the cutest rentals we’ve seen use stainless steel shelves for stylishly organization, making it easy to keep everything within sight. The best part? You can extend them or shorten them for a customized height. Get it: This shelving unit is a great starter package. Idea: While they’re intended for eggs, that doesn’t mean they can’t work for another use. 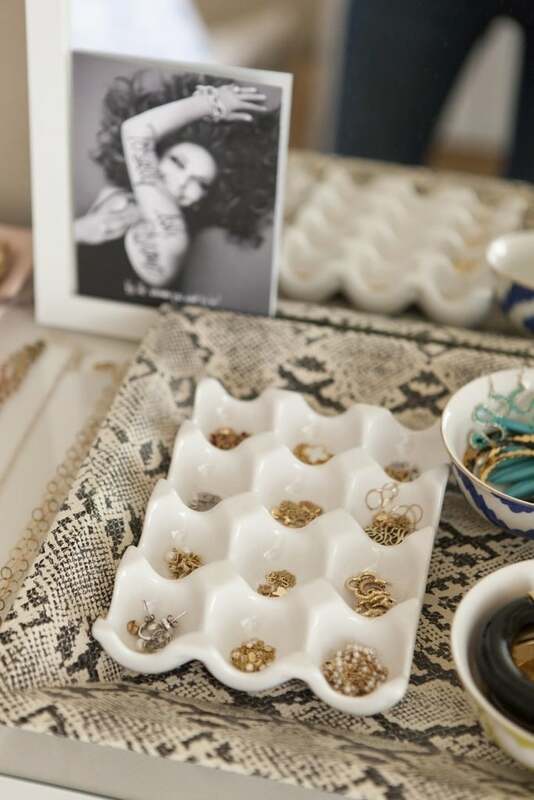 Use the shallow cups to organize rings and earrings. Get it: This ceramic egg crate is a solid buy. Buying your first property is hard, so let’s make it easier for you. Congratulations! You have decided to take the plunge, you have done some reading on what the various responsibilities when it comes to being a homeowner, you have spoken to the bank and have an idea of how much you are able to afford. These steps take some time so we are here to encourage you to take the next step in home ownership. We know it’s a little bit nerve wrecking and a little bit scary, but we have compiled some advice from our in house experts to help you with this exciting time! For many of us, your first home is not going to be your forever home. We recommend taking a holistic approach to purchasing property. Even if you are going to be living in that property, look at it as an investment as well. For those first homebuyers who do not want to compromise on space, you may have to look further out depending on your budget or look for townhouses or terraces. If you are looking to keep more of your lifestyle, an inner city apartment may be the apt living situation for you. What we emphasise is buying smart and seeing your home purchase as more than just a living situation but a step in growing your portfolio. You might want to ask yourself “How much rent will I get for this apartment?” or “What has been the capital growth in the area over the last few years?”. We think asking these questions will not only give you peace of mind if you have to move out and rent or sell your property, but it is also how many people start their property portfolio. The first one does not have to be picture perfect, but it helps if it is a sound investment. The building, home or internal features are not the only things that you should consider when you buy. Are you in a desirable school catchment zone, are there amenities or transport facilities planned in your area or has a new shopping centre been planned? 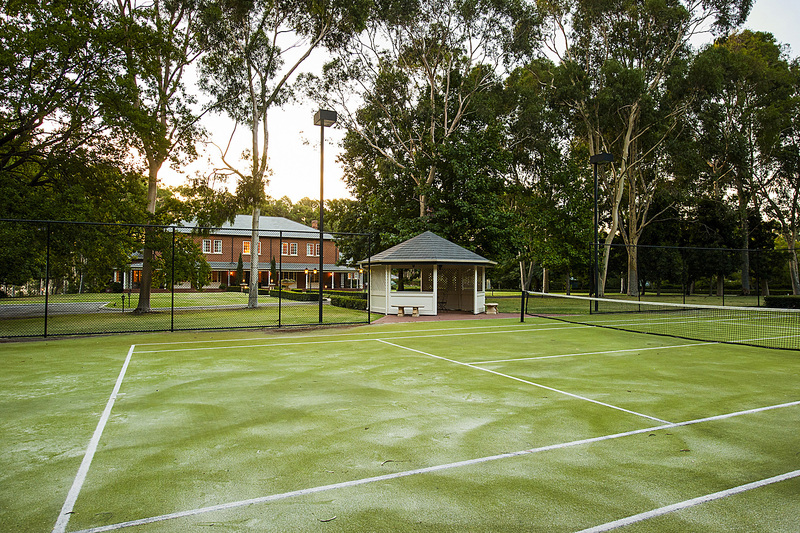 Looking at the amenities and area around you is particularly important, as they are great financial health indicators that the area you are looking to buy in has infrastructure and amenity to attract people to live there. Looking for undervalued suburbs next to the pricier areas is always a something we recommend to our first home buyers – over time, population growth and gentrification will mean that there will be capital growth in your area. It’s always good to also look at areas with employment growth as this will increase demand for homes in that area. Finally, do your research. It takes time to go through all the listings in the area you love and view the various prices they get sold for but it’s all worth it when you know you are on to a great purchase. View the March 2018 quarter Buy-Rent Index. If the idea of getting your home company-ready is keeping you from hosting a dinner party or even your out-of-town in-laws, we can help. Sure, you could spend all day cleaning and decorating in anticipation, but who has the time? Here are the only things you really need to do before your guests arrive. Don’t worry — they are nothing but easy. cinnamon sticks a half hour before guests arrive. We can’t get enough of these yummy-smelling candles. 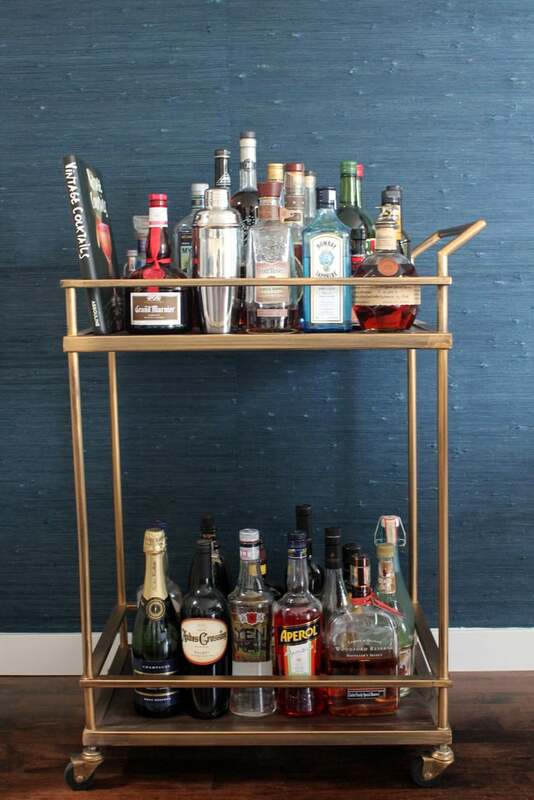 service, but make sure you have the home bar basics covered. will last for a month or longer. appears organised, even if it is just for show! rack, umbrella stand, and a place to sit while taking shoes on or off. 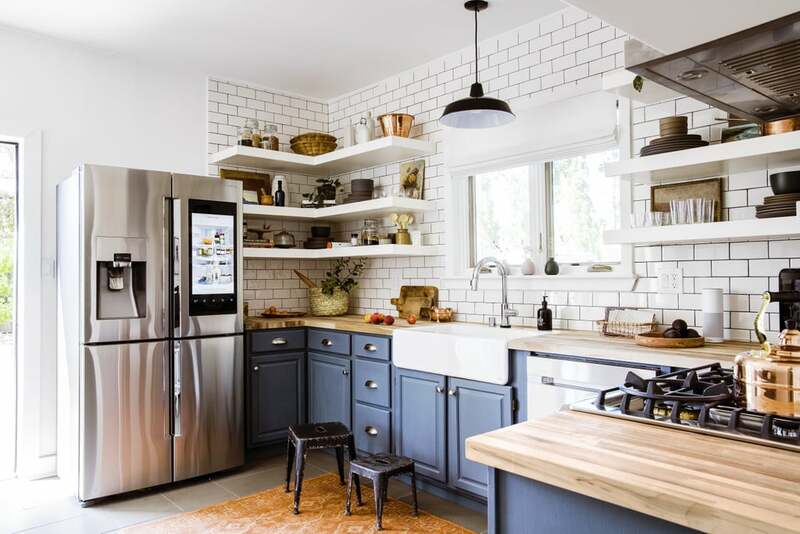 An old home with a lack of square metres might feel limiting to some, but the 83-square-metre, 1900s-era Sunset Smart Cottage proves any space can be transformed with strategic decorating and innovative home gadgets. Even the interior design concept for the cottage involved an emerging tech trend: virtual interior design services. 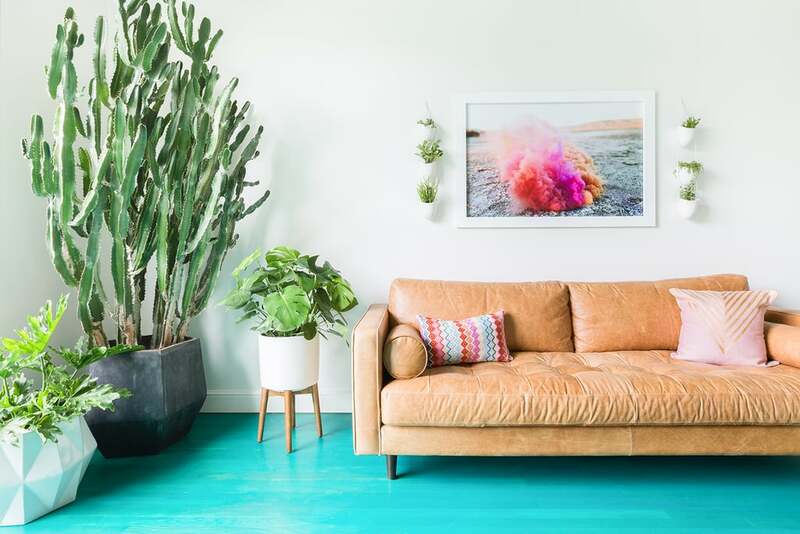 Sunset tapped designers Jessica McCarthy and Emily Gaydon from Decorist, a virtual decorating service that offers a fresh approach to the design and remodelling process. 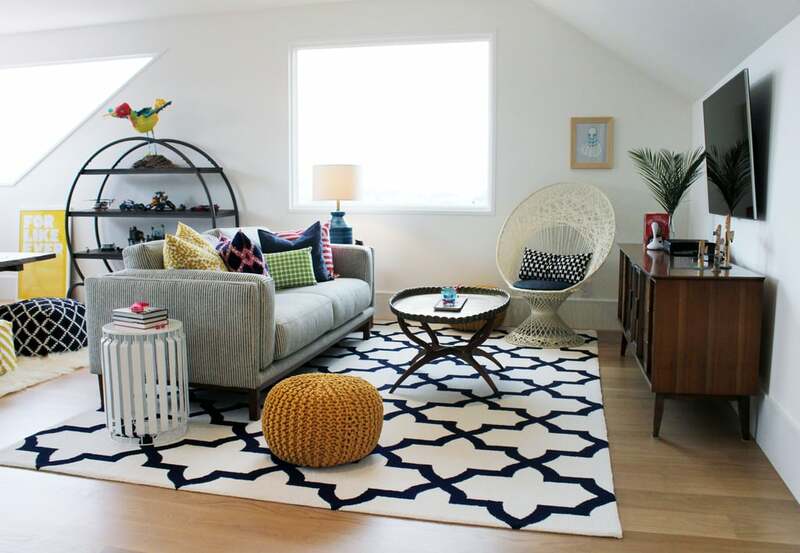 “Online services such as Decorist are often budget friendly and more accessible to the masses. We liked the idea that users can get matched up with designers based on their personal style and goals and can work through the process over email, FaceTime, and even texts,” says Sunset home editor Chantal Lamers. So what exactly was the design strategy behind this tiny tech oasis? 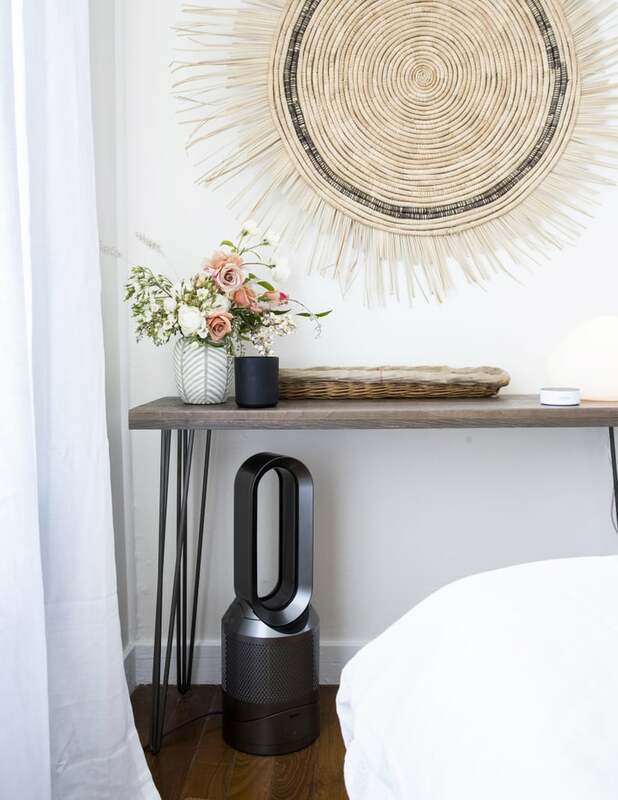 POPSUGAR caught up with Decorist designer Jessica McCarthy to get her insights on the smartest solutions for living large in a small home. 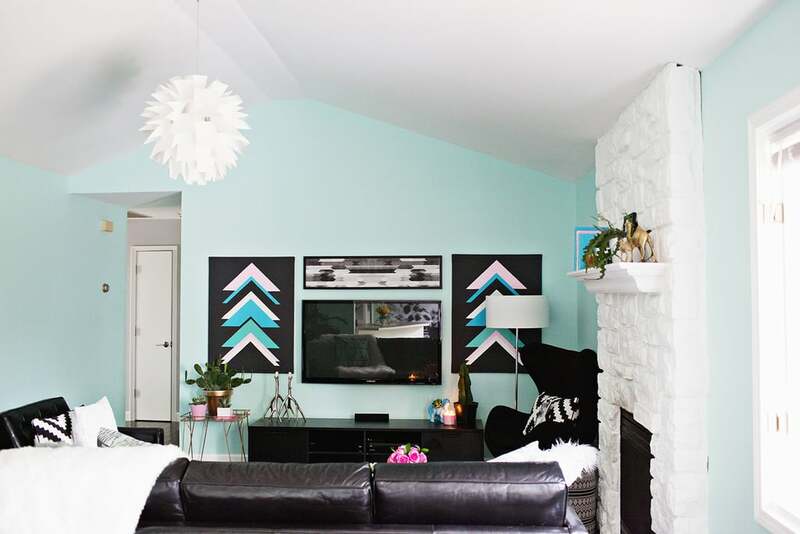 Read on to discover the optical illusions and space-planning secrets she used in every room! 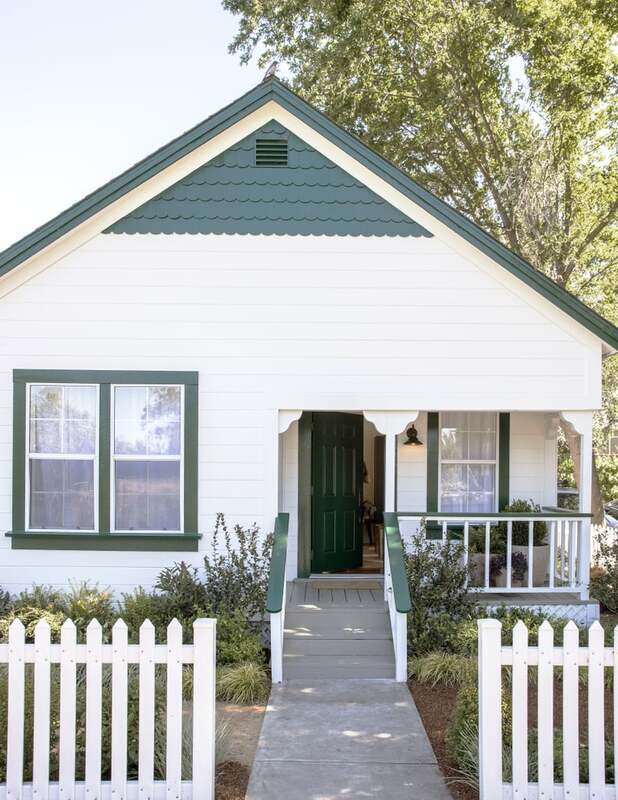 Even the tiniest cottage can have major curb appeal. Jessica suggests painting your front door in a bold hue and replacing the exterior hardware. The cost-effective upgrades are details guests will definitely notice. Keep landscaping affordable and low-maintenance by planting drought-friendly shrubs and perennials from the Sunset Western Garden Collection. 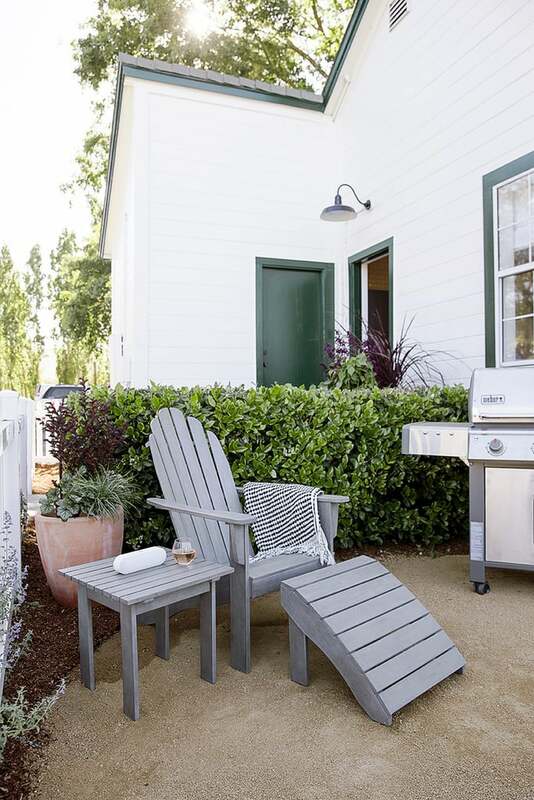 Top off the look by adding a few potted plants to the porch for an extra touch of greenery. 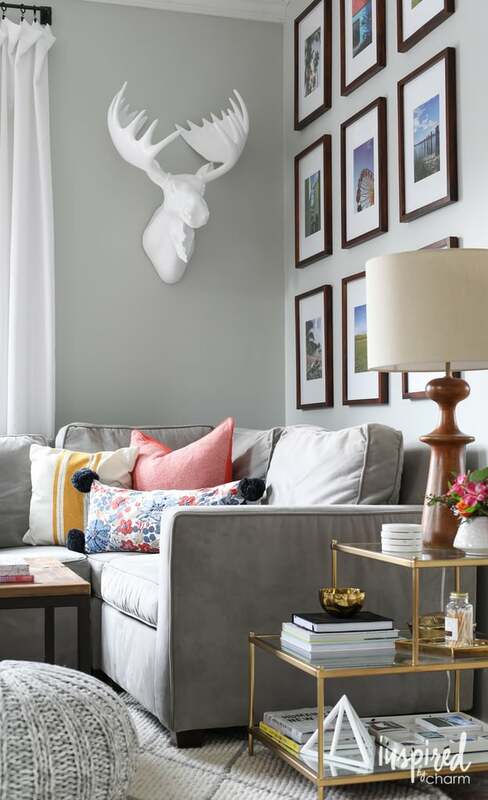 To combat the claustrophobic feel of a narrow living room, Jessica suggests opting for a neutral colour palette and avoiding bold patterns to make the room feel large and airy. Since colour and pattern take a backseat, you can go wild with texture. Grasscloth wallpaper, leather seating, linen curtains, and a variety of throw pillows give the space a rich, layered feel. 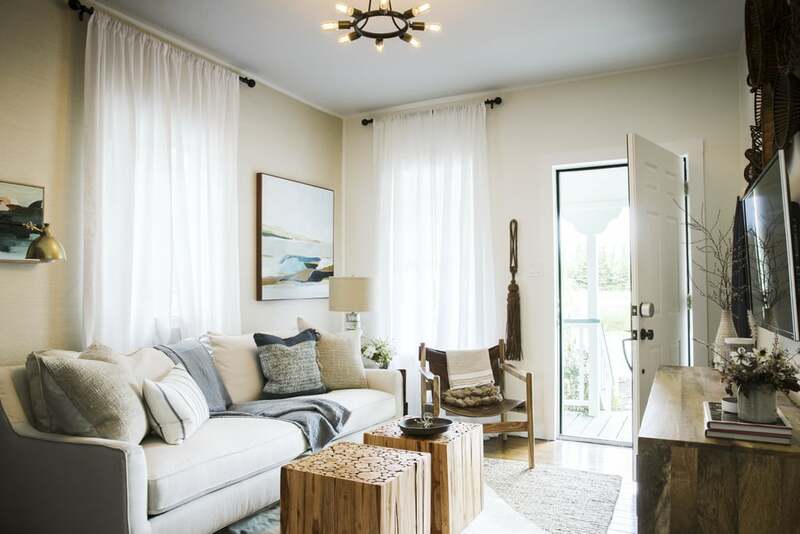 To complete the look, add a semi-flushmount instead of a hanging pendant or chandelier to make the ceilings feel even taller and hang curtains as high as possible. Take advantage of precious wall space by creating a media station that is discreet and beautiful. 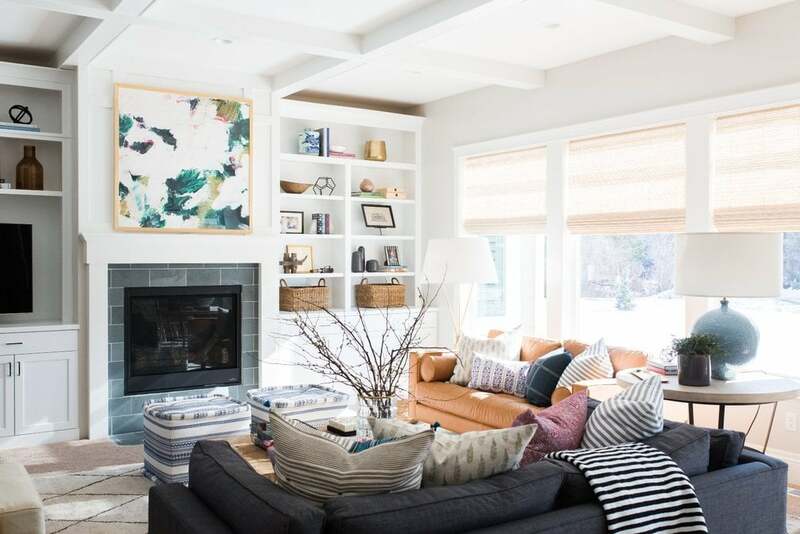 Jessica suggests thinking outside of the gallery wall box by incorporating gorgeous baskets instead of framed art to distract from the floating TV screen. Keeping baskets in the same colour family is Jessica’s trick for achieving a clean and uncluttered vibe. While Jessica wanted to keep the colour minimal, she used an accent colour throughout the house for fluidity. 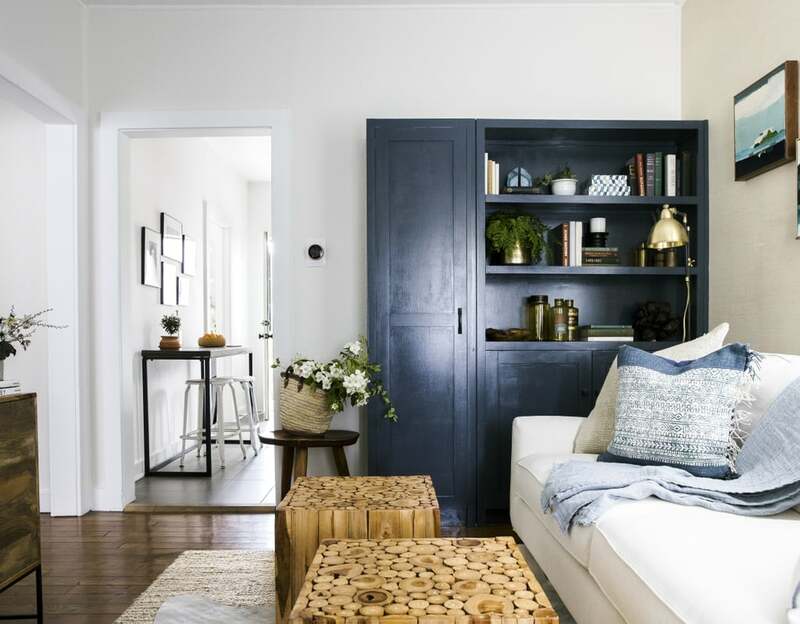 In this case, a custom-built cabinet in navy ties in with the sofa pillows and kitchen, but it also conceals clutter behind cabinets and displays beautiful objects on shelves. Just because you have a small kitchen doesn’t mean you can’t eat in it. Jessica loves the idea of pushing a narrow console against a wall and adding bar stools for a makeshift dining nook. Eliminating upper cabinets can visually expand a small kitchen. 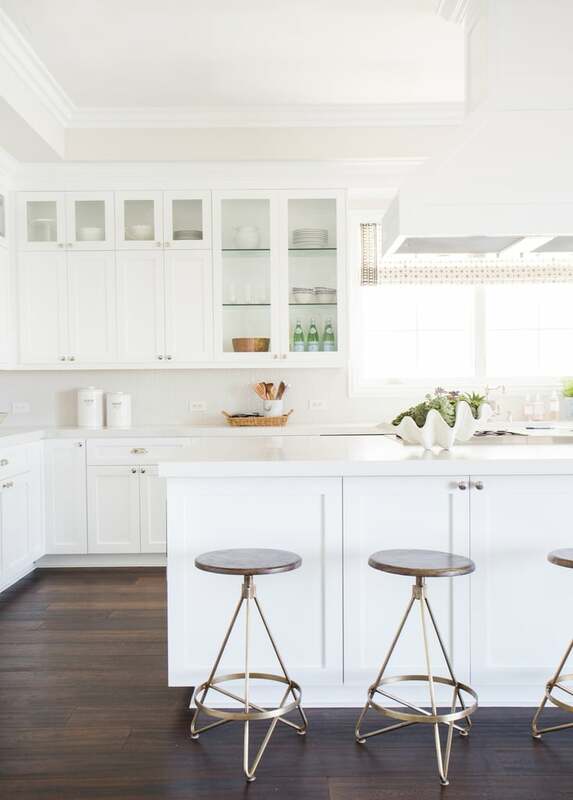 Jessica leveraged the brightening power of counter-to-ceiling white subway tiles paired with white floating shelves for an airy and undeniably stylish effect. If a remodel isn’t in the works, Jessica suggests painting cabinets and installing new hardware for a customised look. 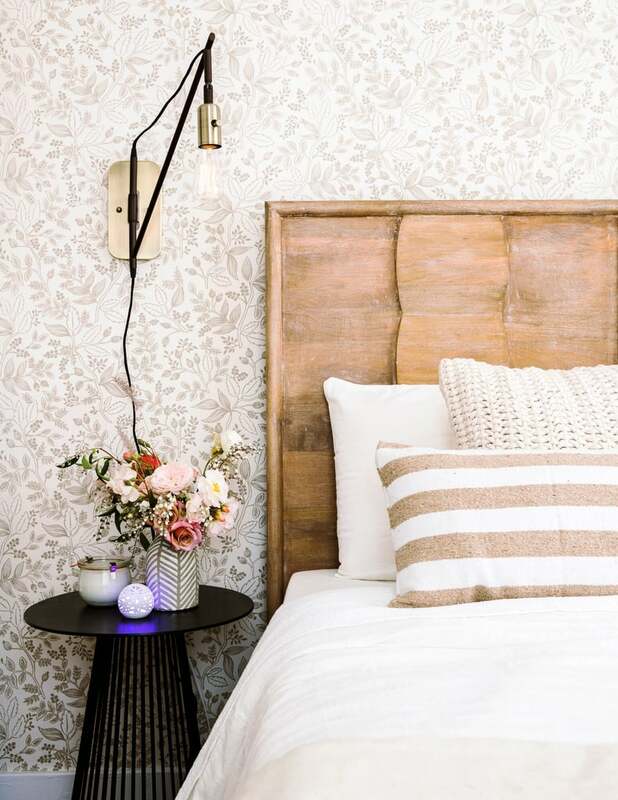 If spacious nightstands aren’t in the cards, swap in petite side tables and free up table space by installing plug-in sconces that don’t require expensive or permanent electrical work. Like the living room, the bedroom also follows suit with a calming colour palette. 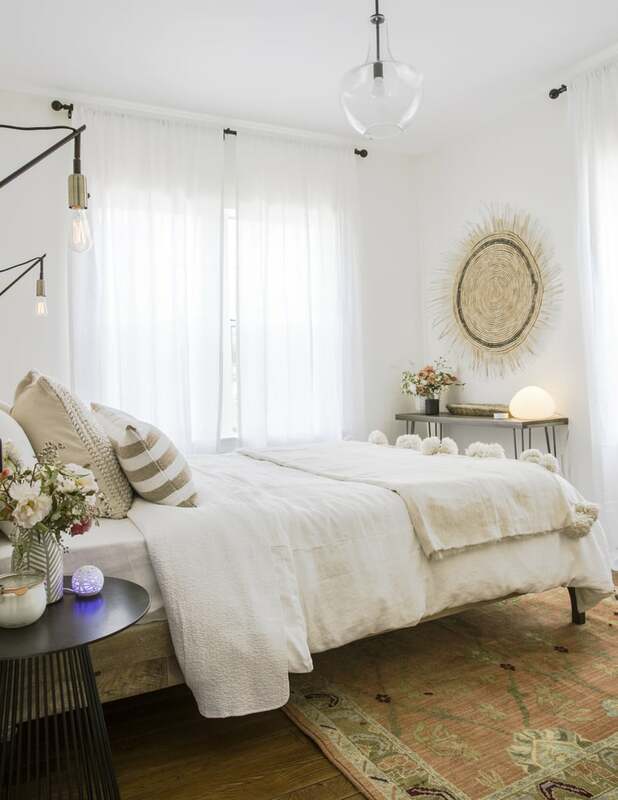 Jessica chose a single tone and explored a range of shades on the walls, bedding, rug, and accent decor. 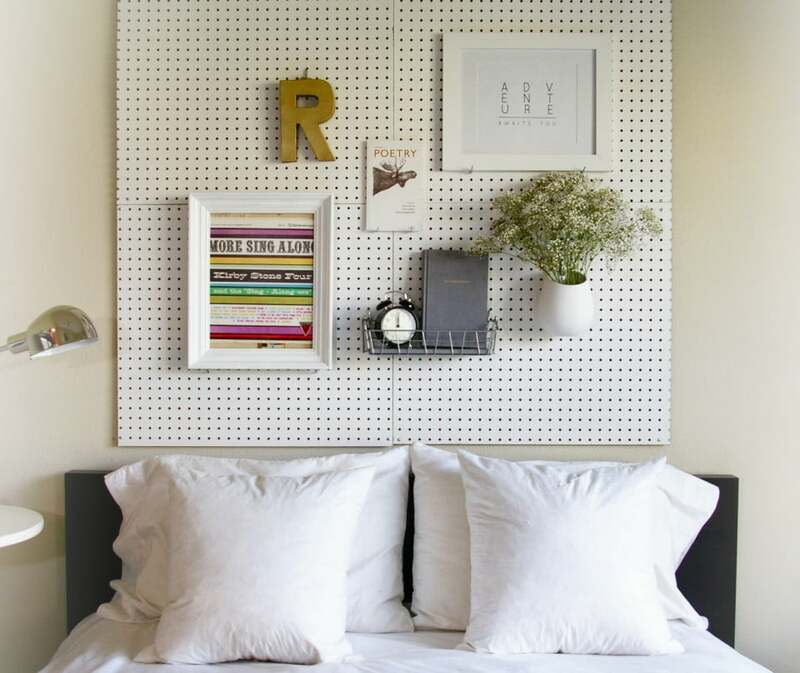 Small bedrooms don’t necessarily require diminutive art. 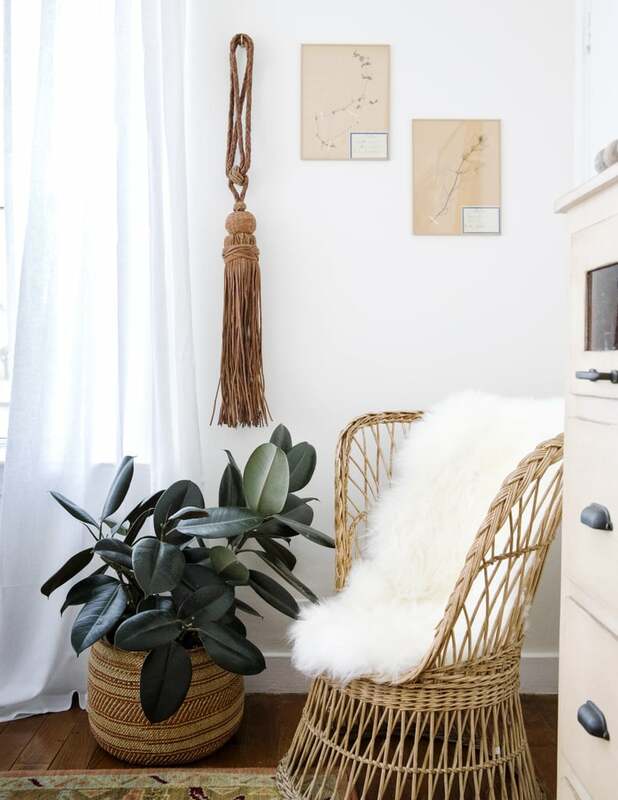 In fact, Jessica recommends doing the exact opposite by hanging large baskets, textural pieces, vintage finds from travels, and oversize prints to really make a statement. To make a big design impact in a corner of the room, mix pieces with varying textures. Jessica especially likes the way the leather wall object, wicker chair, and fur throw create a cosy effect that feels curated. A murphy bed can be the perfect solution for children’s rooms that require space to play or a guest room that can double as an office. 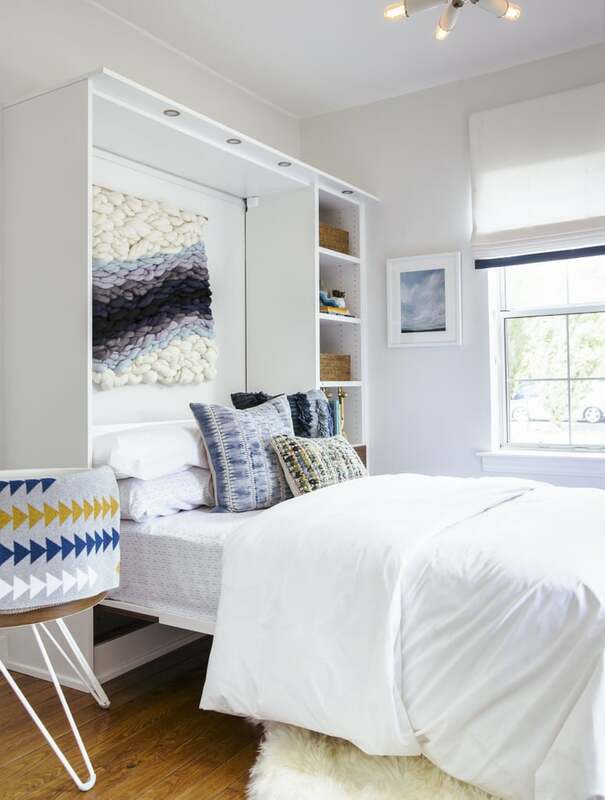 Jessica likes the idea of hanging something dramatic but soft above the bed, like the woven wall art. The texture adds interest but won’t break or budge when the bed is closed. Katy Milton of California Closets designed the built-in cabinetry to make the most out of a tiny closet. 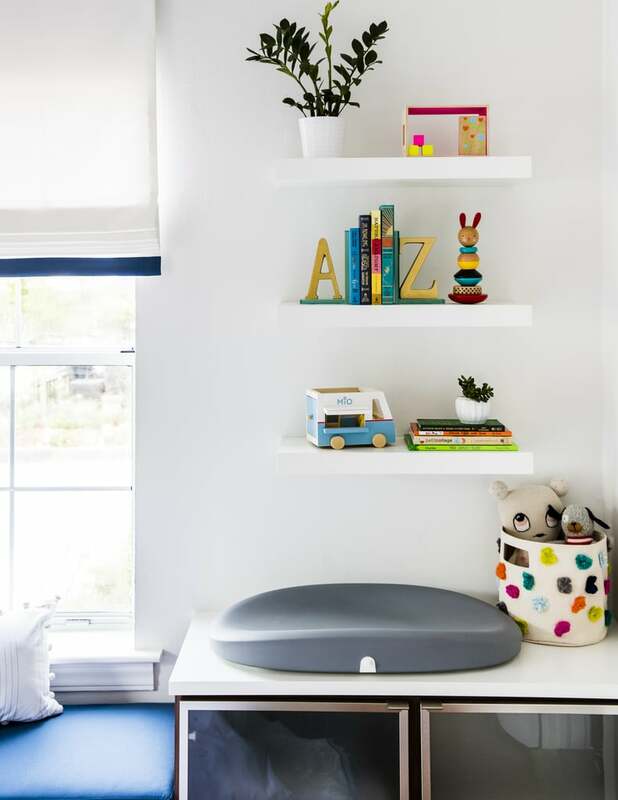 Jessica recommends adding baskets and bins to cleverly conceal clutter while keeping things in order. 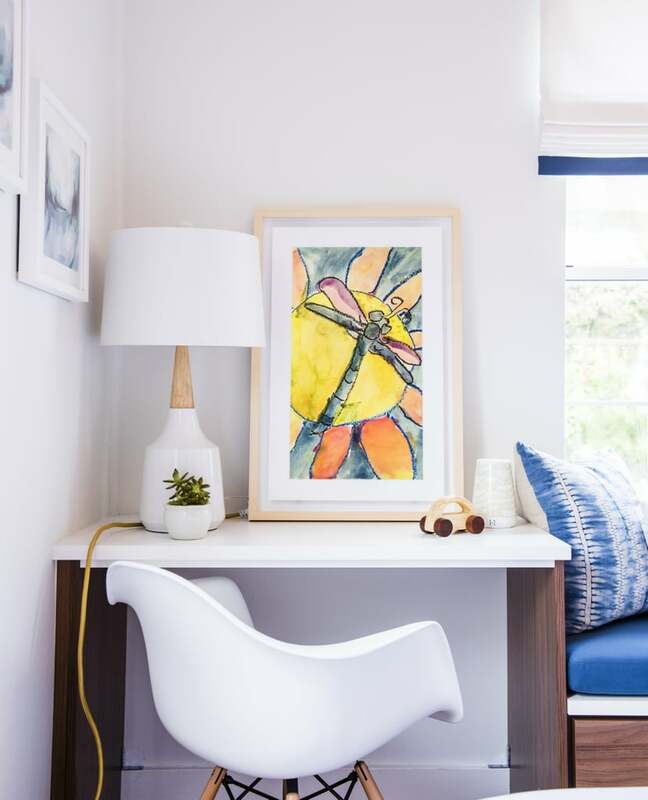 Multifunctional pieces like a small desk, which can be used as an extra table surface for displaying decor, doing homework, and being creative, are one of Jessica’s favourite small-room staples. If you have multiple pieces of children’s art or a group of family photos without the space to hang them, consider investing in the Meural. It’s a digital canvas that gives you instant access to over 30,000 works of art, but which also allows you to upload your child’s drawings and rotate between images. Jessica believes shelving can double as eye candy when you mix in your favorite artwork and accessories. Create the illusion of more square footage by selecting the right colour palette and working in some cosmetic details. 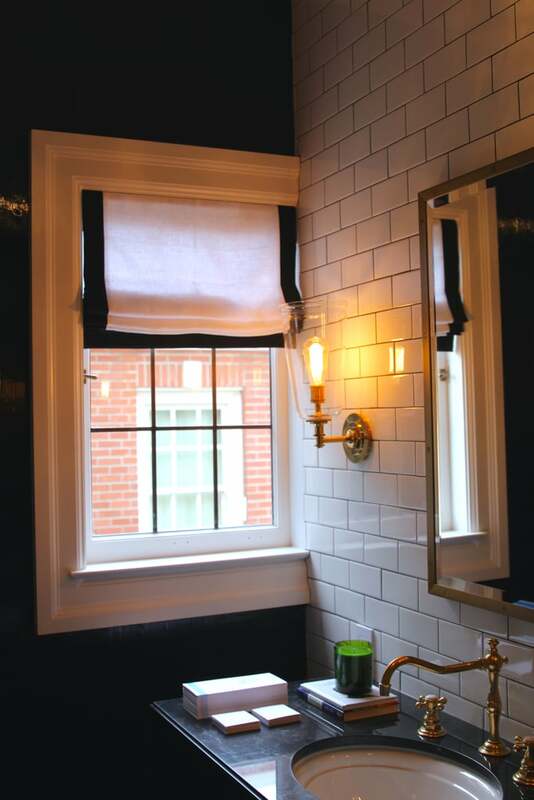 Jessica likes to use large mirrors and extra layers of lighting with sconces to make the space appear larger. 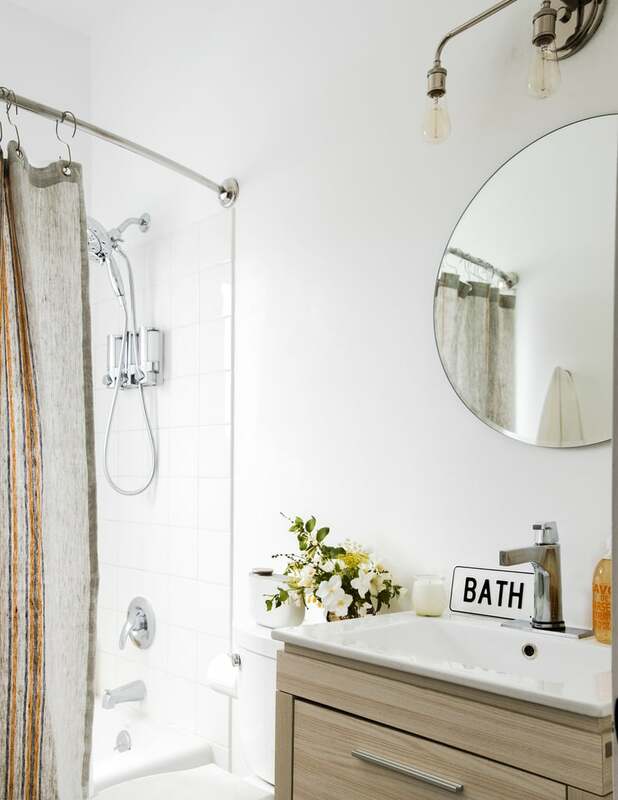 Keeping the space clutter-free and minimally accessorised is another tricks she recommends for small bathrooms. First home buyers are active in Perth’s property market, with data for the March 2018 quarter revealing an increase in sales for properties priced $500,000 and below. REIWA President Hayden Groves said after observing subdued first home buyer activity during the December 2017 quarter, it was pleasing to see the lower end of the market strengthen early in 2018. “The final quarter of 2017 saw the composition of the Perth market shift. Last quarter there were significantly more sales in the higher priced end of the market and less in the first home buyer price range. It’s been a different story this quarter, with the balance of sales shifting back to the lower end of the market,” Mr Groves said. Perth’s preliminary median house price is $510,000 for the March 2018 quarter. Mr Groves said once all sales settle, this figure was expected to increase to $517,000, which would put the March 2018 quarter median marginally lower (by 0.6 per cent) than the December 2017 quarter. “Although Perth’s median house price experienced a minor adjustment during the March 2018 quarter, the median house price is up 0.4 per cent when compared to the same time last year, which shows prices are stable,” Mr Groves said. Perth’s preliminary median unit price is $401,000 for the March 2018 quarter. “This is expected to lift to $410,000 once all sales settle, which would put it equal with the December quarter median. “These results are in line with REIWA’s 2018 forecast, which expects stable conditions throughout the remainder of this year, with moderate price growth during the next 12 months,” Mr Groves said. Preliminary Landgate data shows there were 5,865 dwelling sales during the March 2018 quarter. “We expect around 6,603 sales for the quarter overall, which is marginally lower than volumes recorded during the December quarter,” Mr Groves said. There was a 5.7 per cent increase in house sales in the sub-$500,000 price range during the March 2018 quarter. “Increased activity in the lower end of the market is usually a sign first home buyers are active. We are fortunate the dream of home ownership is more attainable for West Australians than it is on the east coast. After seeing activity drop off last quarter, it’s good to see first home buyers are increasing their presence in the market,” Mr Groves said. There were 14,413 properties for sale in Perth at the end of the March 2018 quarter. Mr Groves said listings had increased 10.2 per cent over the quarter, but were down 2.9 per cent when compared to the March 2017 quarter. “While it is pleasing listings have declined on an annual basis, the increase over the quarter is not cause for alarm. With overall sentiment in WA improving and all signs indicating the market has begun to turn, sellers are feeling more confident than they have been and therefore more inclined to put their property up for sale. “We’ve also seen a sharp decline in rental listings over the past year which has had a flow-on effect to the established market. With some investors choosing to sell their rental property instead of lease it, this has contributed to the rise in the number of properties for sale in Perth,” Mr Groves said. It took 67 days on average to sell a house in Perth during the March 2018 quarter. Mr Groves said although average selling days increased over the quarter, it was still two days quicker to sell than it was during the March 2017 quarter. “With more listings on the market, buyers now have more choice, which has had an impact on the time it takes to sell. It’s very encouraging though, that on an annual basis, we’re seeing average selling days decrease,” Mr Groves said. “Perth’s rental market appears to be building on the momentum of the latter half of 2017, which is very encouraging – not just for the rental market, but also for the overall property market. Historically, the sales market follows the rental market during a recovery,” Mr Groves said. “All sub-regions experienced stable median prices except for the South West sub-region, which saw its overall median rent price increase $10 to $330 per week during the quarter,” Mr Groves said. “The median house rent increased to $360 per week, while the median unit rent increased to $325 per week,” Mr Groves said. “Leasing volumes for the March 2018 quarter are up 4.2 per cent compared to the December 2017 quarter,” Mr Groves said. “Compared to the March 2017 quarter, listings for rent are now 18.6 per cent lower than they were at the same time last year. This can be attributed to an increase in population growth to the state and fewer new dwelling commencements occurring in the metro area,” Mr Groves said. “It took 47 days on average for landlords to find a tenant during the March quarter, which is two days faster than the December quarter and three days faster than the March 2017 quarter,” Mr Groves said. In an ideal world, property developers should have a graceful exit from each project, whether they are selling or holding the properties. Of course, life is rarely graceful, and many newbies fail to even consider the end at the start. This is important as there are a number of exit strategies that you must consider long before you begin any development. The first exit is when you transition out of a construction loan, which is when you’re moving from a high interest loan to a more affordable one. Clearly you must be financial enough to still qualify for the new loan – even though it’s cheaper. The thing is the goalposts could have changed dramatically in the length of time it has taken for the project to complete and many a novice has come unstuck because their numbers no longer stacked up in the bank’s eyes. Another exit strategy is out of a joint venture, which I’ll explain in more detail below. The next strategy, which is also the easiest but not necessarily the best, is selling up and moving on. In my experience, joint ventures (JVs) are a great way to develop property but everyone must agree on what happens at the end. My preference with JVs is to both sell or hold instead of buying the other party out. The reason for that is that you don’t want any recriminations in the future, say, if the property you buy off your JV partner increases in value spectacularly, especially where family or friends are involved. Soon, the green-eyed monster will rear its ugly head, and your former JV partner might even accuse you of short changing them. I had a situation once where I had the opportunity to buy my JV partner’s property but it made me feel uneasy because I knew that it would likely increase in value significantly in the years ahead and I didn’t want any bad blood between us. We ended up selling & splitting the profits. It’s not all about money. Even though that waterfront property is now worth about $1 million, I believe I made the right decision because we mix in the same circles so there was never any finger pointing later down the track. So with joint ventures, my recommendation is that both parties agree to either hold or sell to keep everything simple. The biggest mistake with exit strategies is not having one at all! The next one is selling prematurely or holding for too long thinking the market will shift, without taking into consideration holding costs. The best exit strategy is the one that suits your own unique situation, but sometimes making a smaller profit by selling and moving on is better because of the reduced holding costs as well as opportunity costs, too. My exit strategies have been a mix of selling and holding and even though I’m not afraid to sell I usually regret it when the values go up! One I don’t regret, however, is the property I sold to pay for my father-in-law’s medical bills because he got very sick here and he was here only on a tourist visa. He had no insurance so each day in intensive care was $4,500 plus myriad other medical costs. I sold that property for $340,000 but today it’s worth about $650,000. Financially and personally it was the best and easiest thing for me to do to fund his medical treatment and it also an important point. At the end of the day, property investment and property development is all about improving your financial position and being in a better situation when the chips are down. Another major mistake is newbie developers using the profits from their first projects leasing flashy cars to show off their newfound “wealth”. While that’s just silly if you ask me, that lease also kills their borrowing capacity which impacts them financially for any future developments. I have 20 years of investing and developing experience under my belt, but I have never undertaken a large multi-unit development or housing subdivision. I could if I wanted to but I’d rather be a big fish in a small pond than a small fish in a big pond. That’s because if things go wrong, there are more potential buyers for the project. If you’re a small fish in a big pond and things go wrong, you’ll likely be eaten by the top-end of town and there’s nothing graceful about that! One of the most common stumbling blocks for new developers is their egos get in the way. As soon as they start supposedly making “big money”, they splash it out on fast cars and various other things that aren’t overly helpful to their future success. Often these cars are on leases, which, of course dramatically reduces their borrowing capacity. And that’s because they’re not mentally ready for the money. If I look back at many of the mistakes in my life, I can drill it down to three simple things: greed, ego, or plain old stupidity. Some of those you can do something about but you have to be honest with yourself to do so. Property development can be a vehicle to vastly improve your wealth, but you have to take your time to learn the ropes – and be prepared to learn plenty about yourself along the road, too.